A couple of firsts! 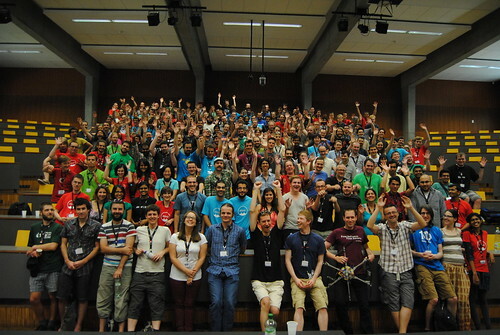 My first time at GUADEC and my first trip abroad as well. And guess what! It was also a first time for GUADEC where it saw 18% women participants! All thanks to wonderful programs like Outreach Program for Women and GSoC internship. Overall, it’s been a nice experience at the conference. For people like me who are new contributors to Free and Open Source Projects, the talks opened up new avenues. Anish Patils’ talk on Predictive Input Methods, Jeff Fortin’s talk on PiTiVi, Srinivasa Raghavan’s talk on Evolution, Juan Pablo Ugarte’s talk on Glade were some of the many that I enjoyed. The lightning talks were wonderful too. Imagine within a span of an hour and a half you get to hear about a lot of interesting stuffs. The interns talked about their projects (where I too presented about my internship project). In another session there were presentations on topics like typeface designs, Terms of Conditions Didn’t Read project among others. I almost felt like standing at an icecream parlour and having difficulty in choosing what to eat since there are so many lovely flavours! You can check out the videos from here if you are interested. And not only the talks, the conference gives one a chance to meet people whom one has never met before. And even though internet has helped us bridge the physical distances, face-to-face interactions do help to build up rapport with the person with whom you are collaborating or about to collaborate.